Had a great stay! Booze cruise was amazing and the vibes were always good. Great location. Big shout out to Anine. Loved this place! Great location and great staff!! Would really recommend the pubcrawl and beerpong. A big thanks to the staff for making these parties even better!! Also a good place to meet people. Will definitely come back! 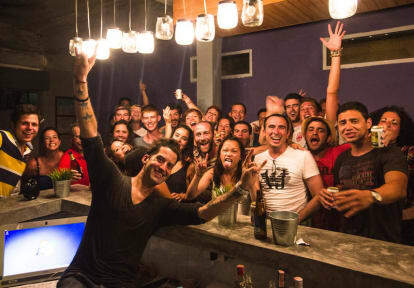 If you're looking for a party hostel this is the place to be! Every day or night they organizing really cool activities. If you want to sleep it is also possible, because most of the time the music stops at 11 and the party moves to other bars. The beds are really nice, with curtains for some privacy. The staff is really friendly and helpful. They make you feel home within the first minute. Specially Anine (she didn't asked me to mention her ;)) but it is true! Also the location is perfect! I got really f***ed up in a good sense, Justin is a champ in keeping the party fresh and dynamic. Thumbs up! Had a great stay! Got dropped of by accident at the wrong Hostel and Dayton immediately proposed to drop me off at the correct building. Staff was extremely nice and made me feel welcome starting from the 1st second! My stay was amazing! Party’s were so much fun and the hostel organizes trips everyday! A perfect place to meet people as a solo traveler. The facilities are not the best but the atmosphere is good.